For aerospace engineers, the holy grail of low drag means conquering laminar flow. NASA (and the NACA before us) has spent a LOT of effort and money to make laminar flow work in real-world applications, which would mean dramatic improvements in fuel efficiency. Image: The black test section of the upper wing skin on this NASA Gulfstream III research aircraft has a line of miniscule bumps at the leading edge that allows the boundary layer airflow to remain stable and smooth over most of the wing’s upper surface. 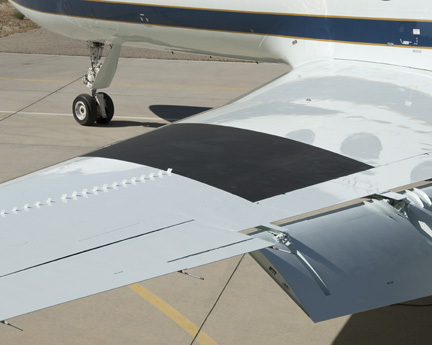 The tiny vertical airfoils mounted outboard of the black test section are vortex generators that keep the airflow attached over the wing surface at cruising speed. Laminar flow is essentially the way airflow travels above and below wing surfaces. A certain amount of air turbulence occurs on the surface of most aircraft wings, regardless of their shape and size. As air moves across a wing, it’s altered by the friction between it and the wing’s surface, changing from a laminar, or smooth, flow at the forward area to more turbulent flow toward the trailing edge. The ideal would be laminar airflow across the entire surface of the wing with no sign of turbulence, which hinders flying performance by increasing aerodynamic drag and fuel consumption. In various efforts dating back decades, NASA has attempted to achieve that ideal. Research by the NACA began in the 1930s with smoke trails photographed in a Langley wind tunnel and continued through the 1990s using such test beds as a Lockheed JetStar and an F-16XL. Today, a new program is getting under way at NASA Dryden that will use the center’s Gulfstream III aircraft and build on the work of the world’s most knowledgeable researchers in this area, Bill Saric and Helen Reed of Texas A&M University. The idea Saric and Reed had is so good it’s simply sheer genius. It’s a known fact that if airflow is excited to a HIGHER frequency than the unstable frequency, waves are stable. Let me say that again: if waves are excited to a higher frequency, airflow is stable; that is, it remains laminar and does not immediately break down and transition to turbulent flow. Saric and Reed’s simple but brilliant idea was to put bumps on the laminar-flow part of a test wing. By carefully adapting the size of the bumps to the depth of the boundary layer (that part of the air flowing next to the skin of the wing), a stable wave can be established in the boundary layer and this allows the flow to remain laminar for long runs (30 to 50 percent of the upper surface) over the wing. The Air Force Research Laboratory issued a grant to Saric and Reed for an experiment that flew to Mach 0.3, a lift coefficient of 0, and a Reynolds number of about 7 million, and showed laminar flow back to about 70 percent over a 30-degree swept wing. Fay Collier, NASA’s expert in laminar flow, was so interested in their idea that he wanted to pursue it further. He was instrumental in getting the Gulfstream project funded to see whether laminar flow could be sustained at the full cruise flight conditions of a modern airliner. The goal will be to achieve significant runs of laminar flow at Mach 0.75, a lift coefficient of 0.3, Reynolds numbers of 25-30 million with laminar flow back to 60 percent over a 30-degree swept wing. These numbers correspond to those of medium-size airliners – somewhere between a 737 and 757. Dryden’s team will be focused on achieving that goal for NASA. To do the job, NASA needed an airplane that had properties similar to aircraft in this size range and could be flown cost-effectively. The Gulfstream III fit a lot of the criteria. The G-III’s wing is big, and the aircraft cruises easily at the necessary flight conditions. Most important, should NASA achieve the proposed laminar flow runs, the promise of a 20-30 percent reduction in fuel burn might save a lot of fuel and energy. Okay. Those of you who are truly interested in the technical aspects of all this and want to dive into the real nuts and bolts, keep reading. So what was the big hold-up in the research all these years? Making laminar flow work in the real world isn’t easy. Minor imperfections in manufacture – things like ripples, wrinkles, rivet heads, bugs, small imperfections in shape, waves in the wing – all prevent laminar flow. Worse, many of these imperfections can be invisible in casual inspection by observers, and prevent laminar flow. And even if all these problems could be solved, it’s still possible to fail in achieving significant runs of laminar flow. It turns out that to cruise at Mach 0.7 to 0.8, the sweep of the wing is an enemy to laminar flow. And cruising at Mach 0.7 to Mach 0.8 is where we want to cruise with modern airliners. In a straight wing, airflow is “pulled” along from the leading edge of the wing to near the wing’s point of maximum thickness, and this helps promote laminar flow. At the maximum thickness, airflow is at its lowest pressure (the low pressure on the upper surface is lower than that of the lower surface, and this pressure difference is the lift; discovery of this phenomena is attributed to eighteenth-century Dutch-Swiss mathematician Daniel Bernoulli). From the max thickness point back to the trailing edge, the air is increasing in pressure. This can be thought of as the air “coasting” uphill against the pressure. As the air does this, the subtle variations in the smoothness of the air are amplified. These small perturbations cause waves in the boundary layer and the flow abruptly breaks down and becomes turbulent. This turbulent flow “scrubs” against the surface of the wing and causes the skin-friction drag of the wing to rise dramatically. Turbulent flow isn’t all bad, as the additional energy in the boundary layer helps prevent flow separation from the surface of the wing (which would cause even more drag than the increased skin friction of turbulent flow). To maximize the amount of laminar flow on a straight wing, designers use very carefully tailored shapes to move the maximum thickness very far aft on the wing. Laminar flow runs of 70 percent on the upper surface and nearly 100 percent on the lower surface are possible if caution is used. The resulting drag is very low compared to conventional turbulent airfoils producing the same lift, as much as 70 percent less. So all this is on the straight wing. A swept wing, which is necessary for flight at high Mach numbers (like Mach 0.7 to 0.8), has a different problem. In this case, the swept leading edge causes an immediate transition from laminar to turbulent flow. The culprit is called crossflow transition. As the flow meets the leading edge, it’s easier for the air to move along the leading edge with the sweep than for it to move over the wing, as it would have on an unswept (or straight) wing. So the flow starts out moving towards the wing tip, and then it curves over the upper or lower surface and finally moves aft toward the trailing edge. But once the flow starts out toward the tip in crossflow the boundary layer transitions from laminar to turbulent and, once transitioned, it is nearly impossible to make the airflow laminar or smooth again. Remember those unstable “waves” in the airflow on the straight wing? The unstable waves in crossflow can be calculated, and are dependent on flight condition. One oddity is that these waves are inherent in the air, and not related specifically to the size of the aircraft; waves don’t scale up or down with the size of the aircraft – wavelength is an inherent property of air. So a T-38 and a 747 (if they had the same wing sweep and wing shape) would experience the same wavelength and pattern. Saric and Reed’s idea resolved the question of what to do about these unstable crossflow waves. With the latest Gulfstream research effort, Dryden hopes to build on their accomplishments as well as on NASA/NACA laminar-flow research spanning nearly 80 years. Here’s hoping that we’re getting closer and closer to that holy grail of ideal conditions and greatly improved fuel efficiency, which will pay off in the form of reduced cost for all kinds of air travel.